Sing Bingo Review | Claim 120 Free Bingo Tickets On Deposit! Do you love singing in the shower and always hog the mic at the karaoke? Then get ready to unleash your inner rock star with Sing Bingo! This site is in the spotlight in our latest review and it’s not surprising as it’s an extraordinary place to play. It comes from the makers of top bingo sites such as Season Bingo and Monkey Bingo. However, Sing Bingo is completely different from its sister sites, which is quite unusual for a site that’s part of a bigger network such as the Ignite Bingo Network in this case. As soon as you join Sing Bingo you’ll be treated to a first deposit bonus of 120 FREE bingo tickets when you add just £10. There are no wagering requirements attached to this offer, so you get to keep what you win! New players will also unlock 24 hours of free bingo games on registration, no deposit required. This means you can get a feel for the site and play for some real cash jackpots without having to enter any card details. Loyalty rewards for regular players. Get £10 for every friend you refer. Like most sites on the Ignite Bingo Network Sing does not feature any bonus codes. This might be a bit of a disappointment if this is what you’re after but we promise you this site isn’t short of bonuses so who needs a bonus code anyway? The mobile revolution has reached Sing Bingo! This means you can enjoy 90 ball, 75 ball and 5 line bingo on the go as well as a wide range of top slots. Getting connected is really straightforward – all you have to do is open your browser on your tablet or smartphone and type in www.singbingo.com then sign in or simply register if you don’t already have login details. The star attraction at Sing Bingo is the games lobby. There’s some serious cash to be won here for pennies – literally! The bingo tickets start from as little as 1p and there are even 1p slots if that’s more your thing. It’s not just the price that’s attractive about these games – whether you want to play bingo or slots all the games are top quality to ensure you always have the best gaming experience possible. If it’s bingo you want to play then you have a sublime selection of bingo rooms to choose from which host a range of 90 ball, 75 ball and 5 line games. It’s easy to navigate your way around the games lobby so it won’t take you long to find your feet. One place you’ll definitely want to visit while you’re in the games lobby is the ‘Free Bingo’ tab where you’ll find three free bingo rooms. The Bingo Academy is open to all players regardless of whether you have made a deposit or not and features small £1 cash prizes every 15 minutes. The other two rooms are for funded players and offer jackpots of up to £50 every hour. When you’re not playing bingo there’s a huge library of top slots to try out. You’ll find popular favourites such as Fluffy Favourites, Cleopatra, Starburst and Rainbow Riches as well as the odd hidden gem. Plus, new titles are always being added to the repertoire so you’ll never get bored of playing here. Among the slots you’ll also find a number of casino games and scratchcards so, there’s plenty of variety here. 120 free tickets on first deposit. No downloadable mobile bingo app. Not as many bonuses as other Ignite brands. £5 Minimum deposit and withdrawal. Five VIP levels offering special perks. 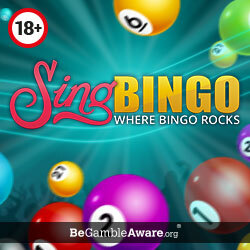 Unquestionably, Sing Bingo is without a doubt, one of the best no deposit bingo sites around today. Not only do you get free games access but you will also receive 120 free bingo tickets on first deposit that feature zero wagering requirements. And although this sounds well and good, the real benefit of joining is the massive selection of games, daily jackpots and just all around fun dished out at this top site. All things considered, there are very few reasons not to have an account on this website and as such, we definitely recommend that you join today.